Mix the flour, butter, sugar, egg, and vanilla extract together in a bowl until you have a smooth dough. Use a printed design to cut out a Christmas Tree shape and a star shape. Roll out the dough flat until it's 0.5cm thick, and use the tree design to cut out 4 tree shapes. Then use a large glass to cut 4 circles, and cut a star shape from the middle of 2 of the circles. Use a straw to cut circles out of 2 trees, and make a hole in the top of each shape for ribbon. Bake the biscuits in the oven at 180°C for 15 minutes until golden brown. Add raspberry jam to 2 tree shapes, and Nutella to the 2 circles. 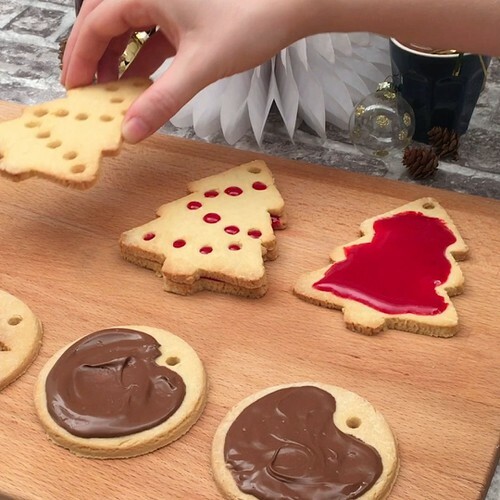 Close the biscuits together, then add ribbon through the holes and hang on the tree. Dust with icing sugar and enjoy your edible decorations!